Did you know that in 2009, almost 13.5 million people took a cruise? Did you know that there are over 200 different cruise ships with over 150,000 cabins? Did you know that you can visit almost 2000 ports of call through out the world on a cruise ship? Did you know that only 20% of U.S. residents have ever taken a cruise? It seems pretty amazing that so little of the U.S. population has ever taken a cruise. What is also pretty amazing is the amount of people who are hooked on cruising. Once you cruise for the first time, you will realize why people are hooked on cruising. What can you expect on a cruise? Cruise ships vary as much as any other travel destination. You can find ships that carry as little as 75 passengers to those that carry over 5,000 passengers. You can find ships that weigh less than 5,000 gross tons to the newest and largest in the world, Royal Caribbean’s Oasis of the Seas and Allure of the Seas, weighing in at well over 200,000 gross tons! lawns- yes, complete with trees! What are the advantages of cruising? One of the advantages of a cruise ship is that it can be considered your floating hotel. You can visit many different destinations but only have to pack and unpack once. You can stay in each different port of call for a few hours to a few days and you can sample the best of what the destination has to offer. Whether you take a helicopter ride over the glaciers in Juneau, Alaska; visit a volcano in Hilo, Hawaii; visit Venice, Rome, Florence or Sicily in Italy; play golf in Bermuda or just relax on 7 mile beach in Grand Cayman, you will get a taste of what each destination has to offer. 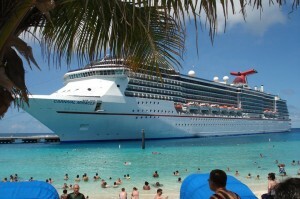 Cruises include many amenities that you would pay extra for in a resort. Meals, and in most cases- 24 hour dining, is included on most cruise ships. 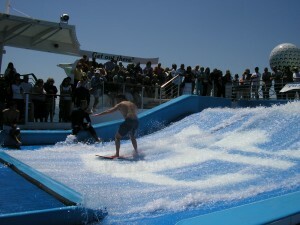 Entertainment, such as Broadway or Las Vegas style shows, comedy shows, live music and daytime pool games and activities, are included on a cruise. Some ships have full size basketball and volleyball courts. You won’t have to pay for a lounge chair or towel at the pool- it’s all included. Many will have a separate program to keep the children and teens busy while the adults get to relax. Just think how much is included in a cruise that you would have to pay extra for on a resort. From sushi bars to steak houses to 24 hour pizzerias, cruise ships have multiple dining options to please every palate. Variety is the operative word in cruise cuisine. You can have a romantic dinner for 2 in a candlelit restaurant, you can enjoy dinner with friends in the dining room at a table for 8, you can eat poolside, you can enjoy the midnight buffet or you can order 24 hour room service. With up to 14 different restaurants or dining options on some ships, you will never go hungry on a cruise ship. If you have special dietary needs, most cruise ships can accommodate you, offering a children’s menu, diabetic cuisine, low fat/salt/calorie, vegetarian or kosher menus. Just let us know of your special dietary needs so that we can notify the cruise staff. Some dining venues might be not be included in the cruise fare so ask us about optional alternative dining options. What kind of cabins are there? Cruise ship cabins are a bit different from a standard hotel room. There are 4 different types of cabins that you can choose from on most cruise ships. The least expensive cabin will be an inside or interior cabin. This cabin will have 2 beds that, in many cases, can convert to a queen size bed. It will have a bathroom with a shower. It will also have closets and drawer space for your clothes. What an inside cabin does not have is a window. What that means is that the room has no natural light coming in. The next type of cabin category is an ocean view or outside cabin. This includes all of the amenities of an inside cabin but it has a window. The window can be a round porthole or a large picture window. You will be able to see outside but you will not be able to open the window. One step up from an ocean view cabin is one with a balcony or veranda. This type of cabin will have a French door or sliding glass door that opens from your room onto a balcony, complete with deck furniture. A balcony is a wonderful place to enjoy your morning coffee, glass of wine or just to relax and look at the ocean. Once you stay in a cabin with a balcony, it’s hard not to have one the next time. Lastly, suites are becoming more common on cruise ships. Some can be as large as an apartment and come complete with a butler. They are the largest accommodations and have the most amenities. Some may include Jacuzzi tubs, pianos, big screen TV’s, multiple bathrooms and bedrooms. 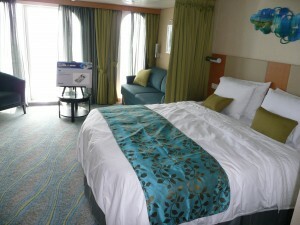 And of course for the ultimate indulgence when taking a cruise, book a suite. They come in many sizes and names but a suite by any name is very sweet! What is there to do on a cruise vacation? may be poolside games, volleyball, miniature golf, art auctions, bingo, horseracing, exercising on state of the art equipment, wine tasting, lectures, getting a massage or spa treatment, playing chess or backgammon, watch a movie, walking, jogging, basketball, or just relaxing. Every night, a newsletter will notify you of the next day’s activities. You can join in on the fun, watch it or make your own fun. When the sun goes down, the parties start. There are shows in the lounges that will make you think that you are in a Broadway theatre or in Las Vegas. The piano bars, jazz bars and discos close when the last person leaves. Most ships have casinos where you can try your luck. Parties on deck, singles parties, return guest parties and cocktail parties add to the fun. It’s hard to be bored on a cruise ship. Where can you go on a cruise ship? There are over 1800 ports of call world wide- some very common, some very obscure. The more common cruises will visit numerous Caribbean islands such as Grand Cayman, St Thomas, Nassau, Jamaica, Aruba, St Lucia, Barbados, as well as ports in Mexico and Central America. You can spend a couple of days docked in Bermuda. You can visit multiple cities in Alaska. You can take a cruise of the Hawaiian Islands and visit many different islands in 7-10 days. You can cruise through the Panama Canal. Europe is another popular option. You can see cities like Rome, Venice, Naples, Barcelona, Monte Carlo, Athens, Santorini, Istanbul on a Western Mediterranean cruise. Other European cruises include ports of call to London, Glasgow, Amsterdam, Lisbon, Copenhagen, Stockholm and St. Petersburg in Russia. Tours can be booked through the cruise line or on your own. Many ships include overnight stays in some ports to give you even more time to explore. Most cruises can be accompanied by a land package, either before or after the cruise, to extend your vacation. Where do I have to go to get on a cruise? Cruise lines are making it easier to get to the cruise piers these days. They are actually bringing the ships to you. In the past, most ships sailed out of Florida or San Juan for Caribbean ports of call. Now, ships from New York, Baltimore, Charlotte, Galveston and New Orleans sail to the Caribbean. You can start a cruise to Alaska in Vancouver, Seattle or San Francisco. You can cruise the Hawaiian Islands round trip from Honolulu or spend some time at sea first by sailing from the Southern California area or from Vancouver. You can even cruise to Europe starting in the U.S. on a transatlantic cruise. Sail across the Atlantic and visit a number of European ports on the same cruise. There are so many options in itineraries and ports of embarkation in cruising now! Cruises costs can vary greatly depending on the length of the cruise, the cruise line, the type of accommodation and the time of the year. Times when schools are closed will usually be the most costly. Many families are cruising together and like to do so when the children are out of school. Cruises can be 3 days in length to 182 days, so prices will vary there too. Prices will depend on the cruise line and the ship. There are budget cruise lines, moderate lines, premium and luxury. Each will give you a different cruise experience and the prices will depend on what you choose. If you take into consideration all that the cruise lines include vs. a land vacation, you will find that cruising is a very good value. How to cruise for less? You can cruise for free by organizing a group of friends and family. With most cruise lines, when 8 cabins are booked, 1 person will cruise for free (they will only pay port charges and taxes). When 16 cabins are booked, you and a friend can cruise for free (pay only port charges and taxes). It’s fun to travel with a group! I will take care of the details and you get the benefit. Call me for details! NOW! There is no bad time to take a cruise. Certain itineraries only sail at specific times of the year, for instance, Alaska, Bermuda, Panama Canal and Europe. The Caribbean, Mexico and Hawaii are year round itineraries. Whether you want sightseeing, beaches or a combination of both, My Vacation Lady can find the perfect cruise for you! Take the stress out of cruise vacation planning. Let My Vacation Lady help you evaluate different types of cruises and plan a memorable cruise vacation for you. Call now (732) 418-0819 or or send us an email.